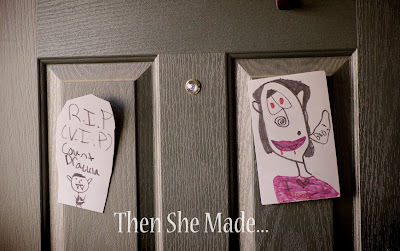 Then she made...: Fail or Fun? I have a confession! I'm so not into fall or Halloween this year. Not sure why, maybe it's just that I have a lot of other things on my mind and a lot of other things to do. Regardless, my house is un-decorated. It's OCTOBER 25th! Yes, I know, fail! However, something fun has come out of my lack of motivation. My kids have taken over. Little Bug started asking me months ago if we could get out the decorations, it was too soon then. Come October 1st though she was raring to go. We got out the box of decorations but other than some spider webbing, the box has remained untouched. It still sits by the side of our couch! Instead, she and her sister took it upon themselves to be creative. First, they drew these for our front door. Ya, it cracks me up. One of them drew Mr. Count with fresh blood on his lips. (he looks kind of friendly for a blood sucking count) The other one drew him a headstone. I guess the blood he drank was deadly. She wrote "R.I.P" - that seems appropriate for Halloween. But then she followed it with "V.I.P". Apparently Mr. Count was a very important person. They are cute but here's where it gets fun. Bug drew this and put it up by our stairs to the basement. It's hard to see because it's white-on-white but there is a ghost on the left. He's the head ghost - his speech bubble says "Forward March!" Then it appears there is an army of ghost following in line. They are in unison saying "Boo!" The sign below, drawn in her best scary lettering says, "Beware of the Williams - They have an army of ghost!". Scary, right! I'll admit I really didn't get it but Bug was very happy with her work. She was so happy with it, she started being almost protective of it. You know kids. Because of this protectiveness, her dad started teasing her and would take a ghost off the end of the line and would move it. At first, the ghost would just move to a neighboring wall. Bug would realize it was moved, pitch a little fit, vocally express her complaint and then move it back. 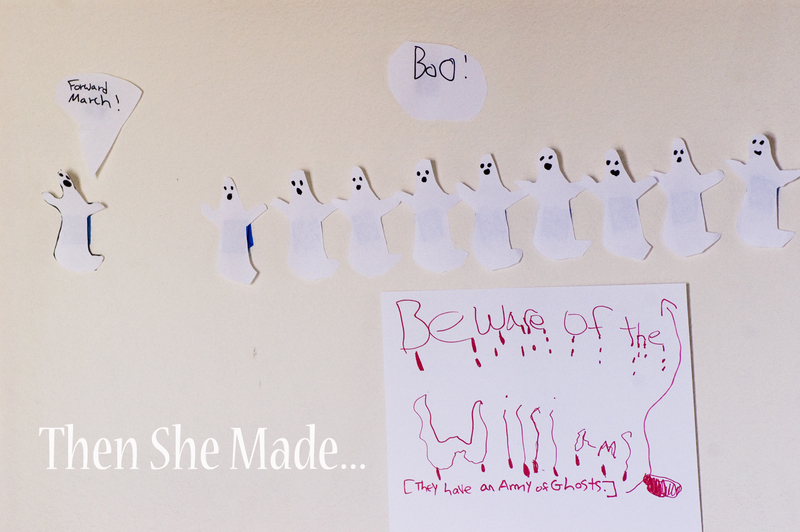 Then she'd count them to make sure all her ghost were there and accounted for. This process would repeat sometimes several times a day. Eventually, the rest of the family got involved too. It has turned into a fun little game. Our own version of Halloween Elf on the Shelf in a sense. Where is he hiding? What is he doing? 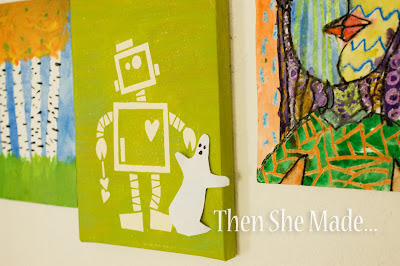 Today Mr. Ghost is on military leave and is hanging out on the art wall with his new friend Mr. Robot. I imagine it will take Bug a little while to find him, but she will. Then she'll roll her eyes, and say "Mom!" She acts like she hates it but we all know the smirk - that smile she tries to hide - really mean she loves it. It's been a fun little game that all happened because I lacked motivation. Honestly, I was feeling a little guilty about not decorating. Like I was ruining my children's Halloween fun. BUT as it turns out, things just have a way of taking themselves in a new direction. Isn't that how life is? I'm actually kind of happy about it now. It's been a fun little game for our family. One that I think we will have to continue next year too. I sense a tradition coming on. Our little ghost will have to evolve into something more sturdy though. 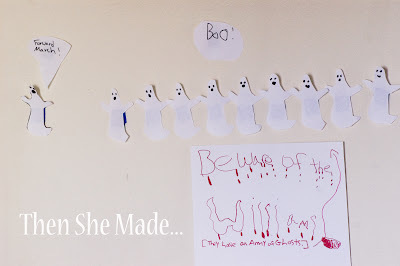 Luckily, I know a crafty gal who's suddenly in the mood to make Halloween decorations with her kids! It's sort of like the kids playing with the box instead of the toy when they get a gift. It wasn't the intended activity but it's still lots of fun!